With equities sliding to a new cycle low of sp'1820, the VIX built on opening gains, hitting a new peak of 31.06, but settling +15.2% @ 26.25. 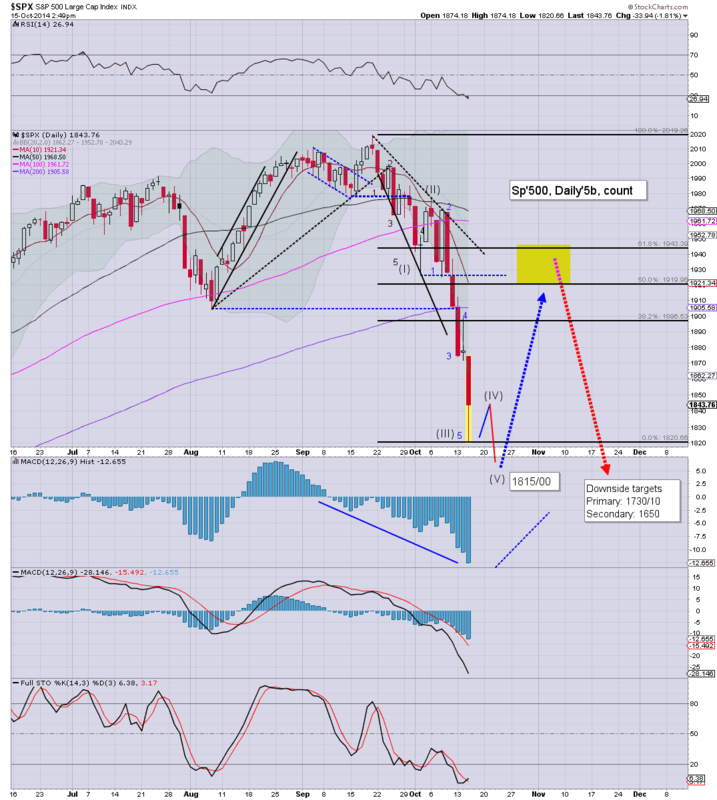 Near term outlook is for another wave lower in equities, which should equate to VIX once again in the low 30s. Most notable aspect of the day, VIX breaking the summer 2012 high of 27s, into the 31s. We're now back to levels last seen in late 2011. I am still seeking a significant bounce back into the sp'1900s, which would like equate to VIX back in the upper/mid teens.. before VIX going nuclear in November.. to the 40s. US equities closed well above the lows, but price action was fiercely bearish, sp'500 settling -15pts @1862 (intra range 1869/20). The two leaders - Trans/R2K, settled +0.2% and +1.1% respectively. 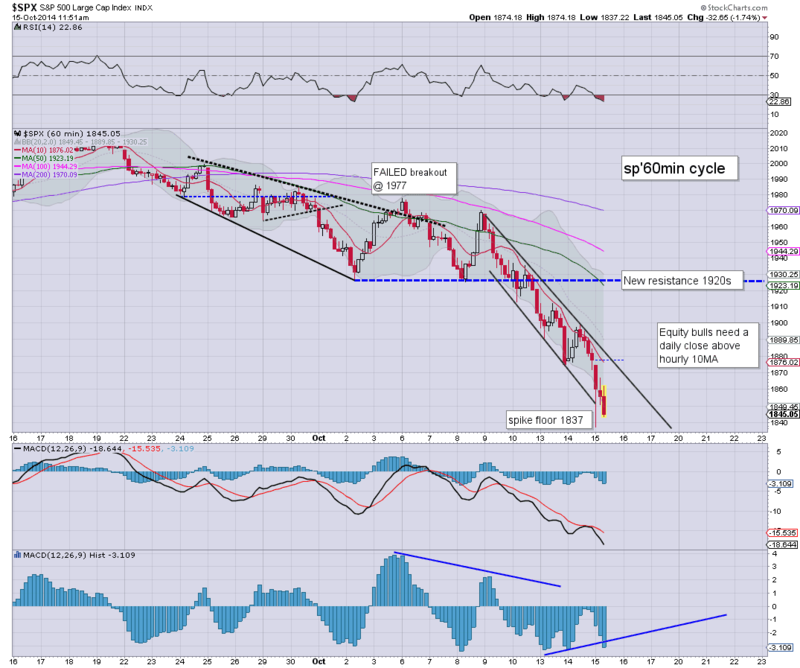 Near term outlook is for sp'1815/00 zone, before a rebound into the 1900s. ... a pretty exciting day, and with another wave of declines, the bigger picture is even more clearer. Having slipped from 2019 to 1820... that is almost a full 10% from the Alibaba high of Sept'19th. We look headed for a sig' bounce... back into the 1900s.. by early November.. and then we should see an even stronger down wave... to the sp'1600s.. with VIX 40s. Crazy days are ahead.... the phrase 'don't lose your head' comes to mind. US equities remain significantly lower, having broken a new cycle low of sp'1820, with VIX 31s. There remains high likelihood of another wave lower, before the bull maniacs can sustain some degree of sustained rally. Key resistance is now the 1920/50 zone. *the above count is merely my vain attempt to make some sense of this. It is to be treated 'lightly'...no doubt some of you could detail a hundred valid reasons to disagree with it. Now that we've fallen so far below the old 1900 neckline, the notion of a H/S formation is DROPPED... and thus 1990/70s are out. More likely, we'll get stuck in the 1920/50 zone...before an even stronger move down in November. 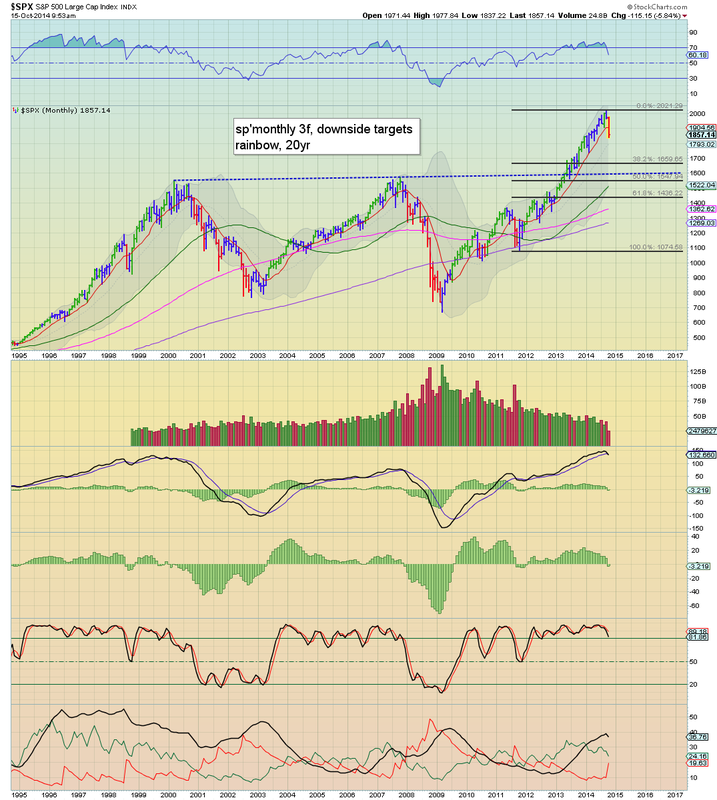 We're headed for 1650 or so... some kind of back test of the old 2000/2007 double top. Friday opex for a key turn? Would be unusual, but...it'd fit... with the current price action. 3.26pm... hourly 10MA remains key resistance, early tomorrow.. that will be around 1820... and it really isn't too hard to envision 1815/00 zone.. with VIX 30s again. 3.33pm.. Bears getting short-stopped out.... sp' 1858.... VIX 25s.... regardless... its just another wacky intra bounce. 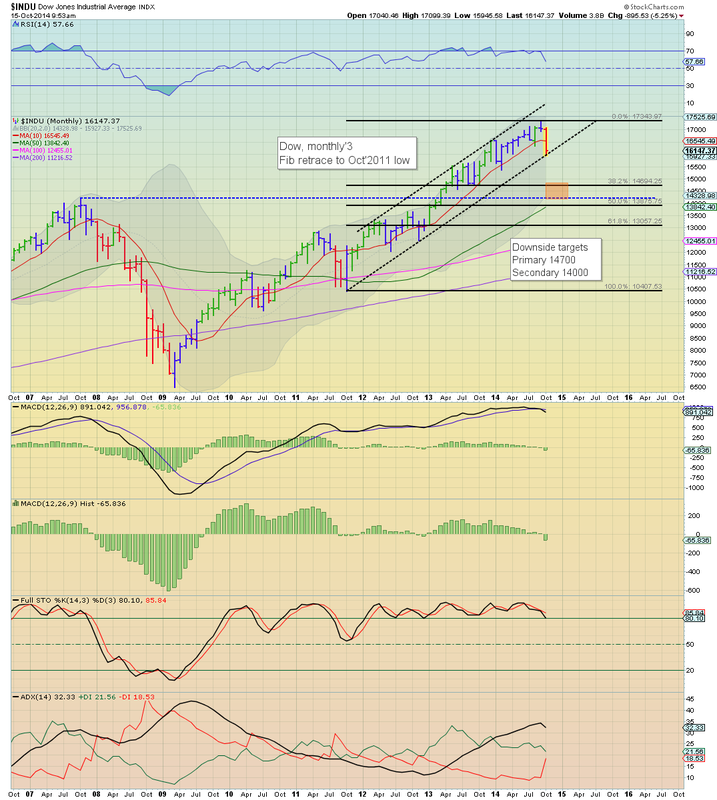 Still look headed for 1815/00 zone on the next wave. 3.42pm... R2K +1.2%..... VIX still cooling +9% in the 25s. Wild swings, but then... to be expected. With equities breaking to a new cycle low of sp'1820, the VIX has continued to climb, hitting a new three year high of 31.06. Some kind of 'full capitulation' looks imminent.. whether late today, or within a few days. Without question, it sure is ugly out there. Price action remains wild.... so... stay strapped in ! 2.01pm.. Beige book .... growth 'modest to moderate'.... not inspiring.. there is nothing for the bulls in that. 2.30pm.. chop chop... sp'1830s.. VIX cooling... 28s... but still.... bears are in FULL control. Looks like we'll take out 1820... and eventually floor in the 1810/00 zone.. before a sustained rebound. 2.40pm... A 25pt bounce to 1845.... call it a sub'4.. or whatever.... still seeking another push lower... <1820. The late morning bounce from sp'1837 to 1866 has been entirely negated, and we're breaking new lows... confirmed via new highs in the VIX of 28.32. 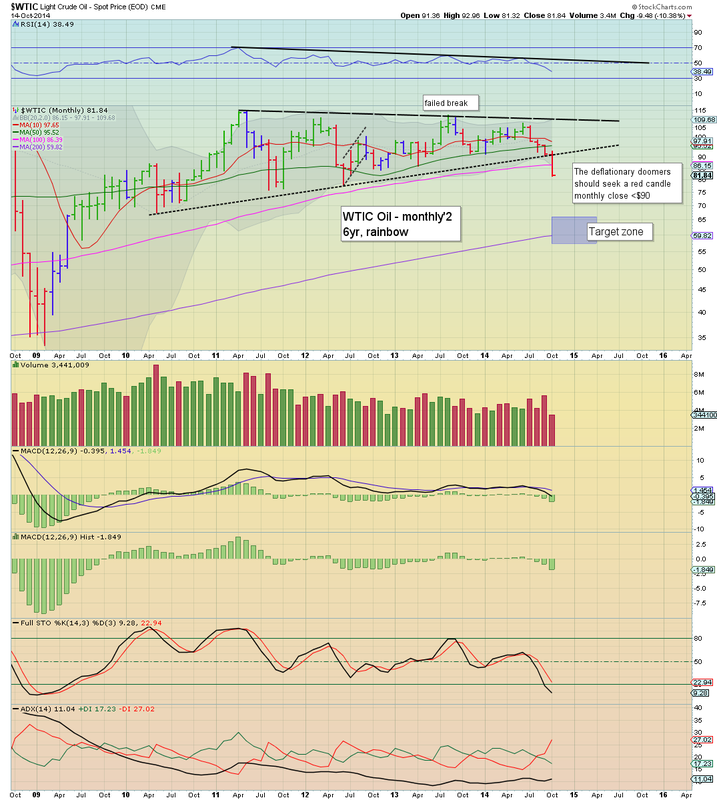 It remains a deeply shaky market, and there appears threat of some kind of major capitulation sell off. Without question, the VIX is the most notable issue, having broken to levels not seen since late 2011. Volatility is back... and is likely here to stay for some months, as we battle lower to the sp'1600s... effectively a giant wave lower in the style of summer 2011. *Market is understandably increasingly concerned with Ebola.. and the periodic press conferences from the CDC are not helping sentiment. 1.18pm... 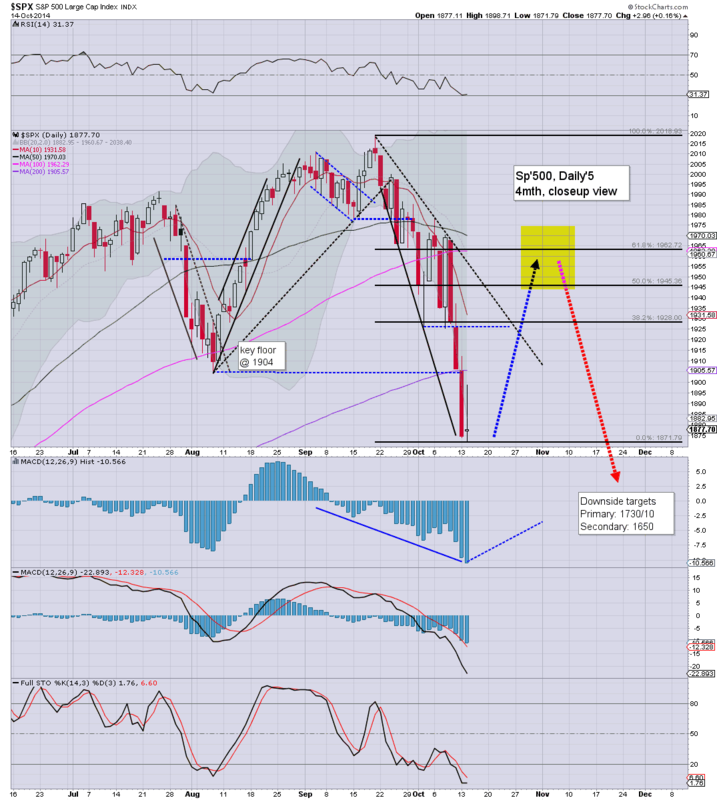 Looking at the broader weekly cycle, there is a lot of price cluster around sp'1820/10 zone... so... I could agree with Hawke on his ES target of 1809. Typical turn is 2.30pm (as ever), but really, a capitulation sell off this afternoon looks in progress. It remains a real mess, there is certainly high threat of new lows later today, although there are reversal candles on many of the daily charts - notably, the R2K. ..still expecting a bounce, as no doubt many others are, but for now, zero sign of it. The point is, the bounce.. when it comes... will be a simple one to short... with huge downside potential to the sp'1600s, with VIX 40s.... next month. 12.27pm.. Possible double top on the VIX in the low 28s, with equity floor of 1837/40. *fed beige book due at 2pm.... something to watch for. 12.45pm.. a CDC press' conf. is due any minute. Market upset.... new equity lows.... 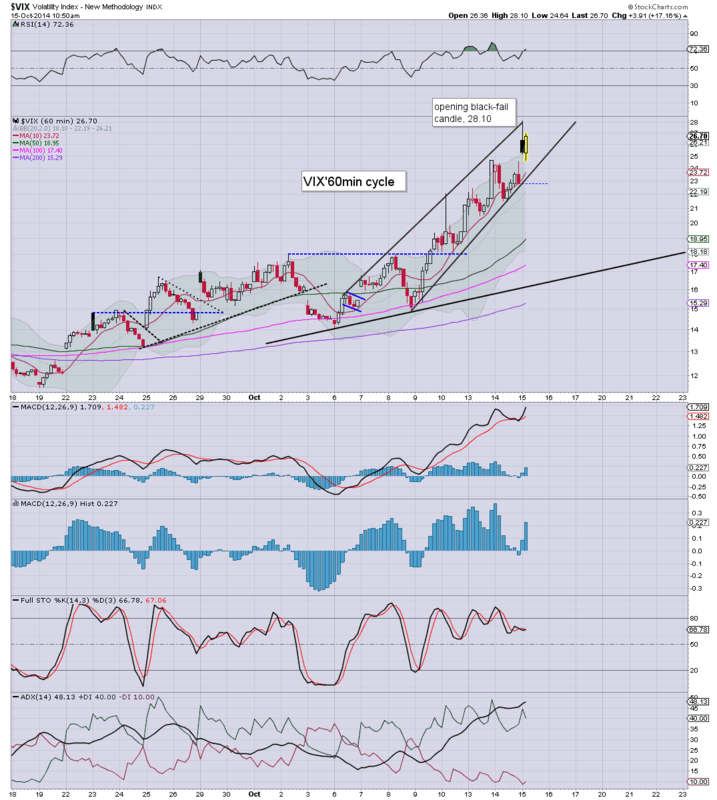 CONFIRMED with new VIX high. US equities remain exceptionally weak, with rather extreme price chop. So far the opening floor of sp'1837 is holding. 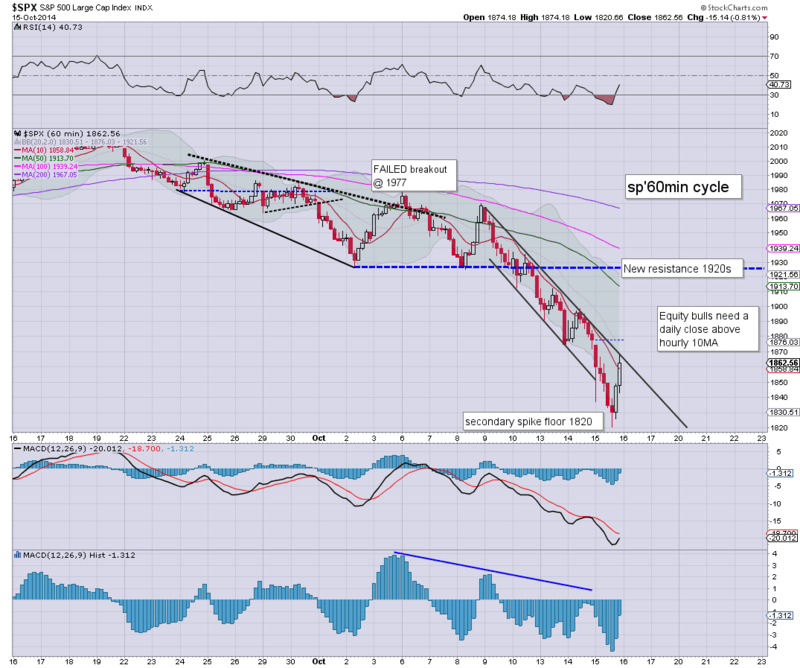 Notably, the VIX opening 30min candle was a black-fail of 28.10, breaking the summer 2012 high. Suffice to say... it remains VERY wild out there today. Price action is extremely dynamic... and even though we have some strong indications of a floor... that was the case yesterday.. only to fail. The bigger picture is without question... bearish.. to the sp'1650s, with VIX 40s. However, I'm still concerned of a 2-3 week bounce.. and let there be no doubt, the sp'1950s are very viable on such a bounce.. which would crush the VIX back into the teens. 11.30am.. Renewed weakness, but we're still holding the low.. with VIX still some way below the earlier high of 28s. US equities open sharply lower, slipping to a new cycle low of sp'1837. 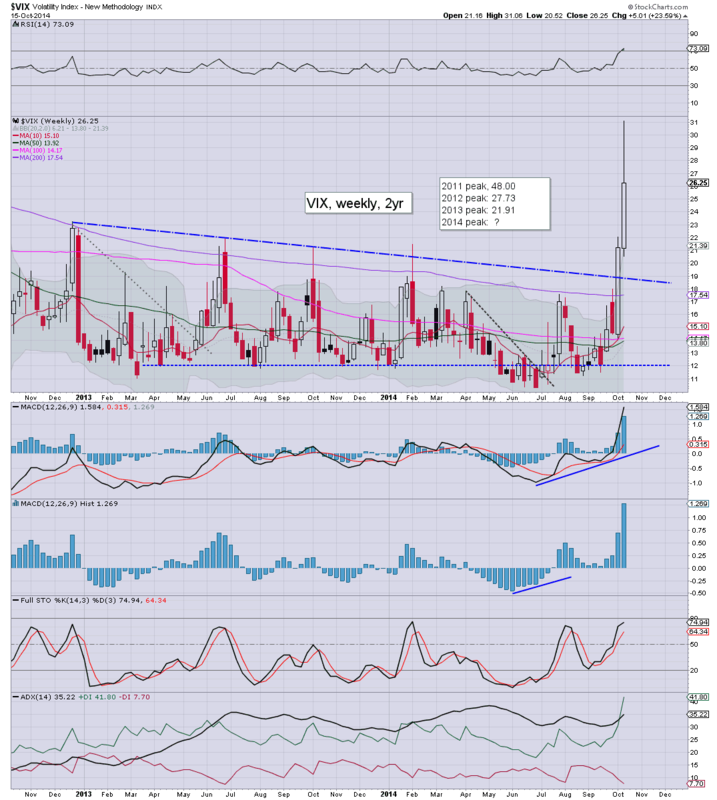 Perhaps even more important, the VIX broke a new high of 28.10, breaking the summer 2012 high of 27.73. We're back to the style of price action from late 2011. Is there ANYONE still doubting a key intermediate top is now in? 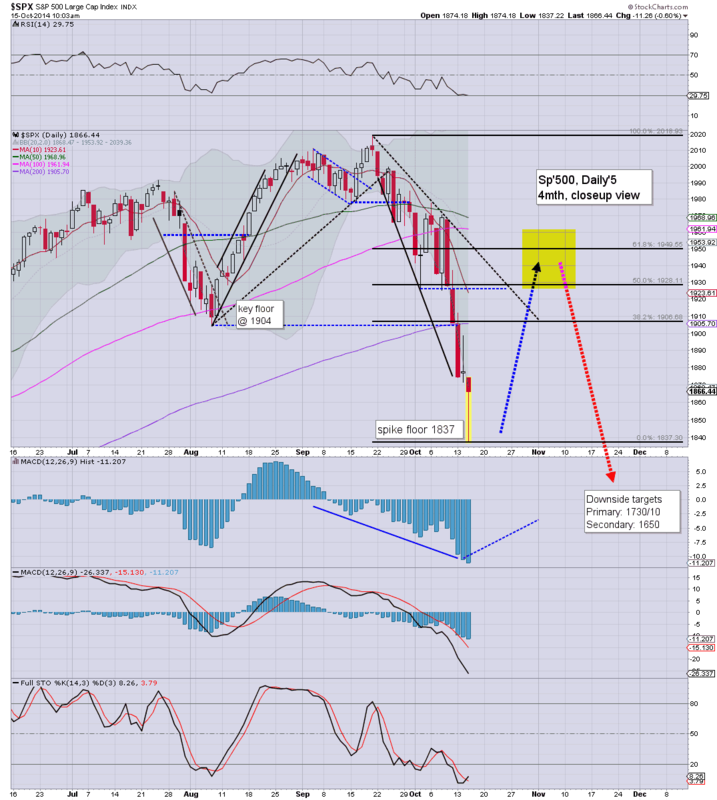 Primary downside target is now sp'1650s.... with Dow 14700.. R2K low 900s. *there remains HIGH threat of a bounce back into the sp'1900s, but clearly, the lower we go... the lower the upside bounce target will be. Even 1950 now looks a damn long way up. 10.15am.. The bounce continues... but the further damage has been done. It would seem the sp'1650s are now a given... probably late next month... along with VIX 40s. 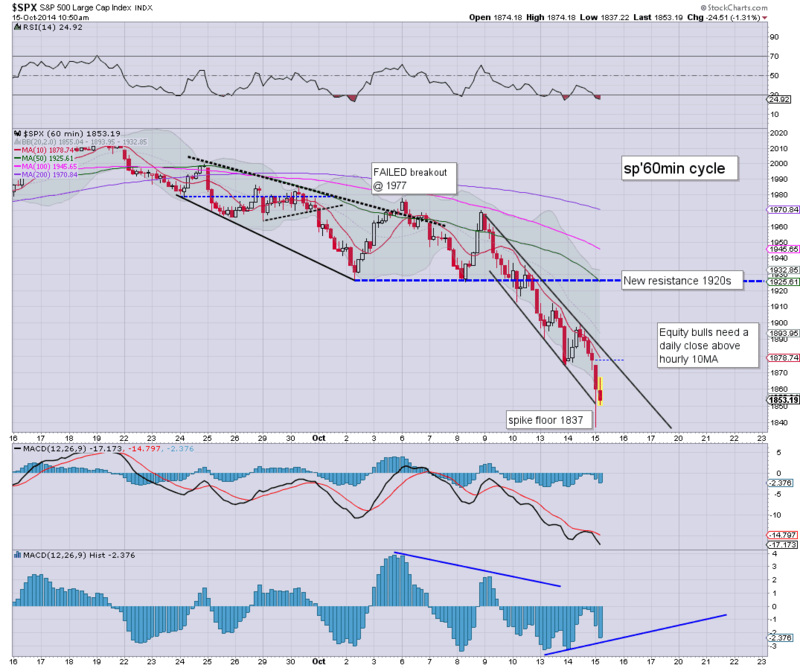 10.30am.. R2K turns positive, Transports set to follow. Good morning. Futures are significantly lower, sp -19pts, we're set to open at 1859. Metals are a little higher, Gold +$3, Oil continues to effectively collapse, -0.8%. 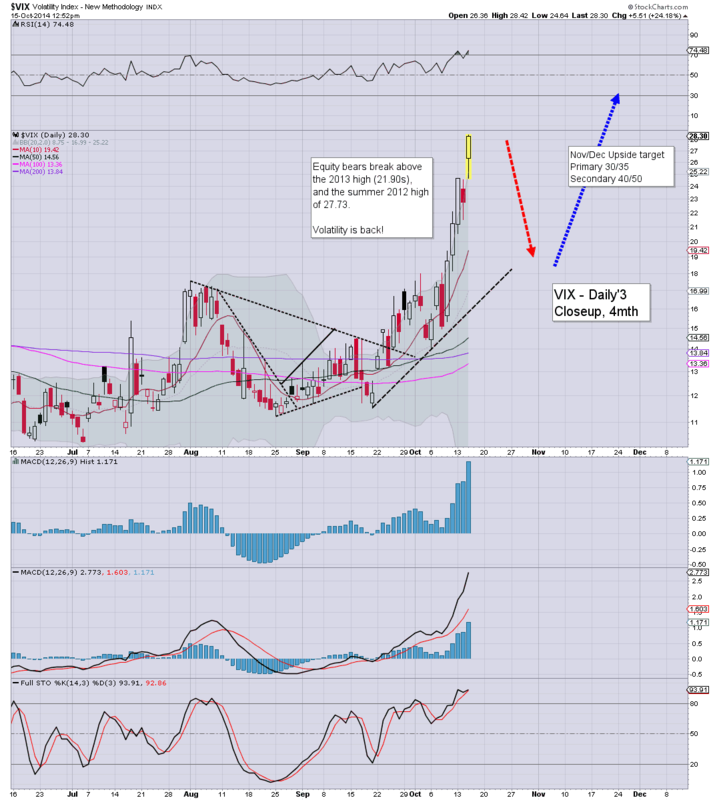 VIX looks set to gap higher in the 26/28 zone. *retail sales miss... -0.3%, not exactly inspiring. Well... the open sure is going to surprise many... myself included. The sp'1850s... which will probably equate to VIX in the 26/27s. Indeed, if VIX 28s today, then it will surpass the 2012 high. Doom chat, Hunter with Mr Shadowstats. INTC -3.5%, post earnings.. even though the numbers were arguably fine. 9.31am.. VIX jumps 15%... to the 26s.... today... confirming the equity weakness. 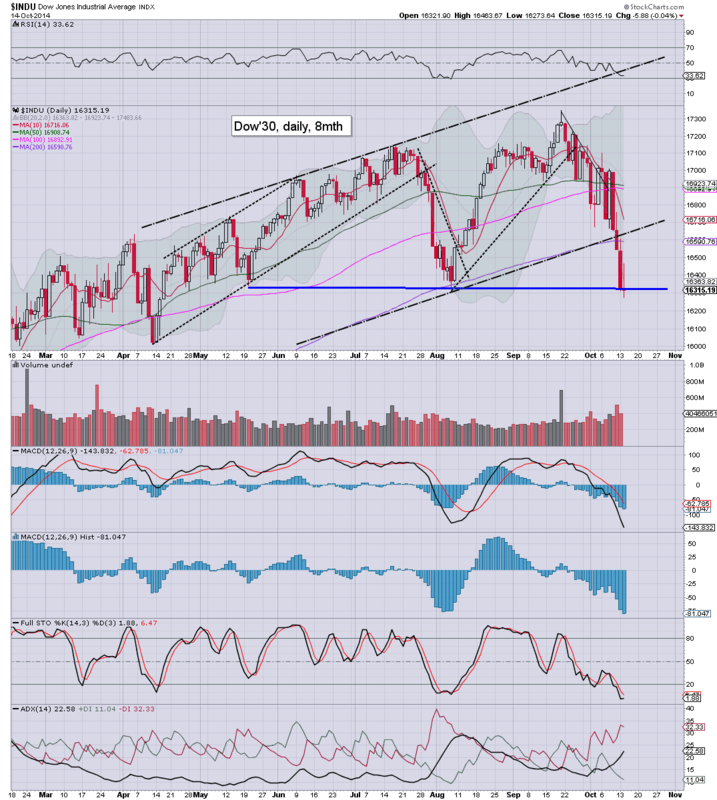 9.34am.. Dow/SP' monthly 'rainbow' candles turn red for the first time since Sept'2011. 9.43am.. VIX still climbing...+20% in the 27s.... testing the summer 2012 high. We're back to levels not seen since 2011. 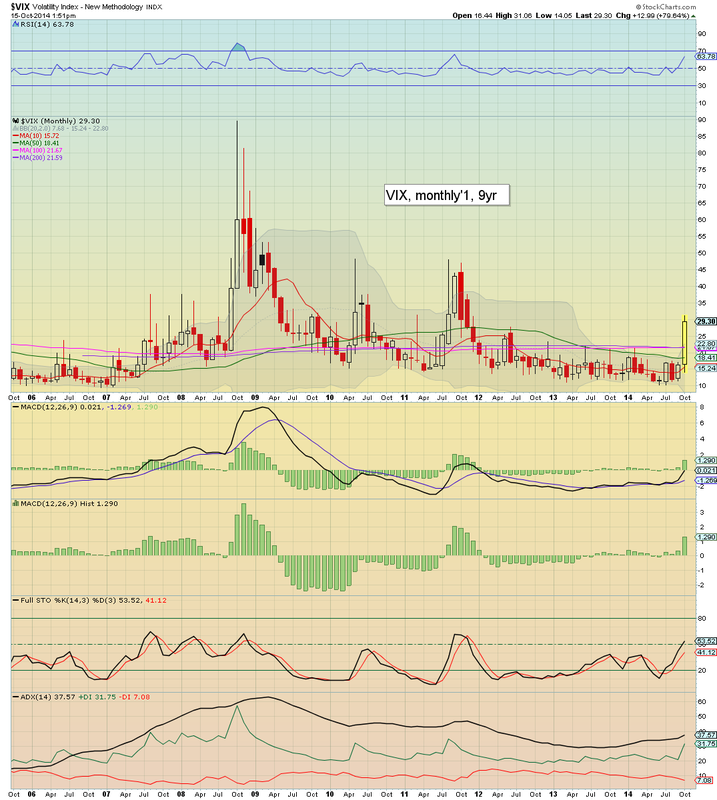 9.48am.. micro bounce... 1938 to 1952... . VIX cooling. 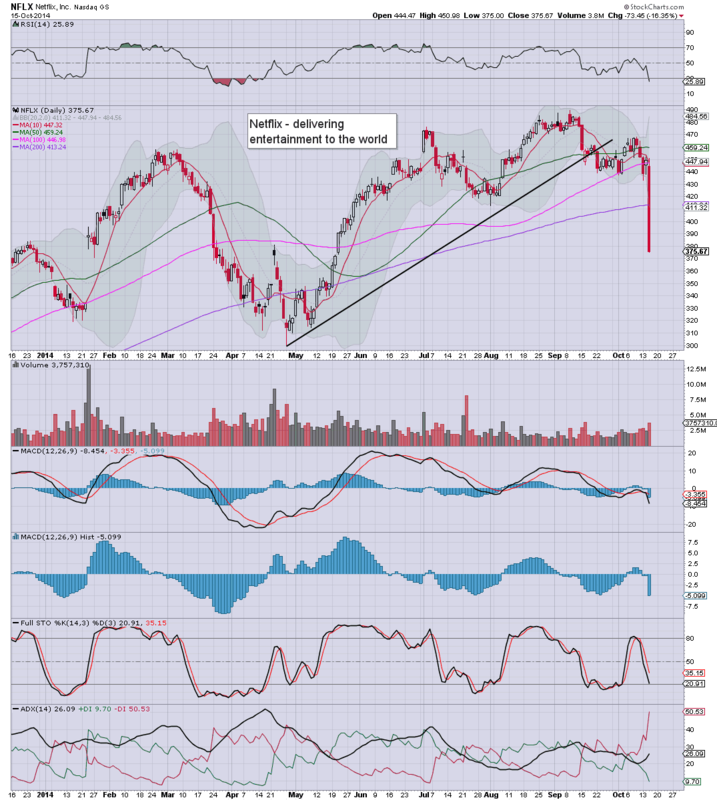 Carnage in the miners... BTU -6%... low $10s. Despite another particularly weak late afternoon, equities did manage to hold net daily gains. An equity bounce spanning 2-3 weeks still appears likely, along with a VIX that would be knocked back into the mid teens. So, a bit of a mixed day for the market, with significant gains for the Trans/R2K, but new cycle lows for the Dow/SP'500. 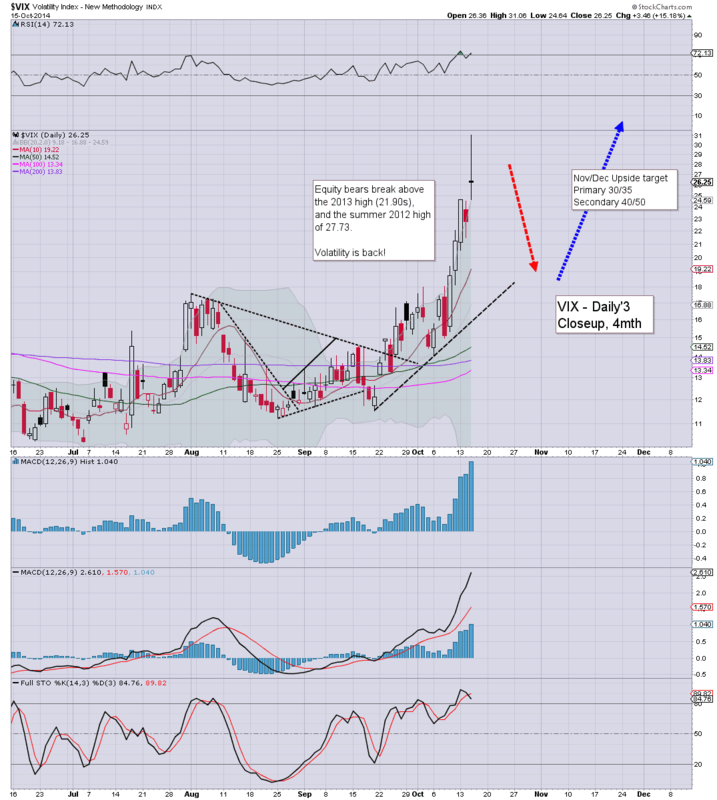 Most notable, the VIX did NOT confirm the new cycle lows, and thus we have a key discrepancy to be mindful of. 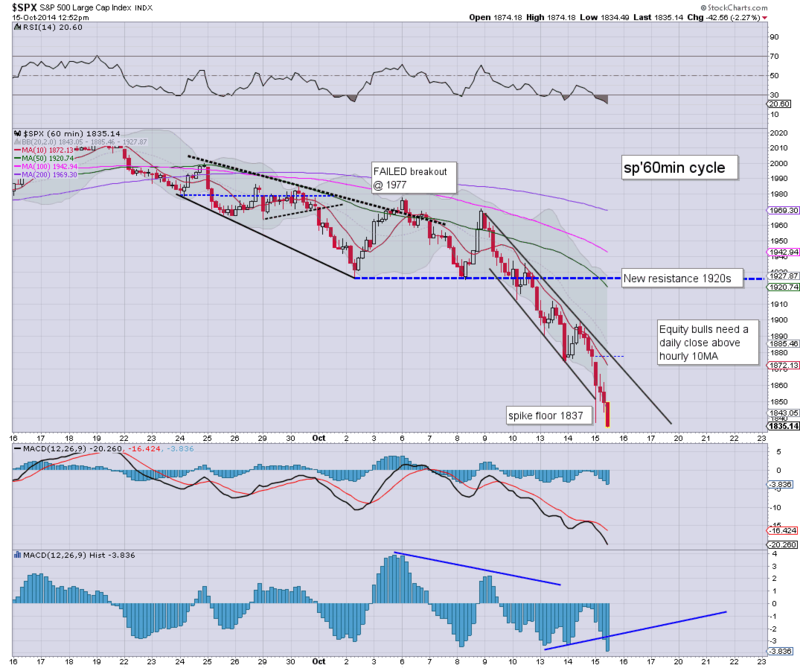 As things are, we continue to hold the third consecutive red candle on the weekly 'rainbow' cycle. 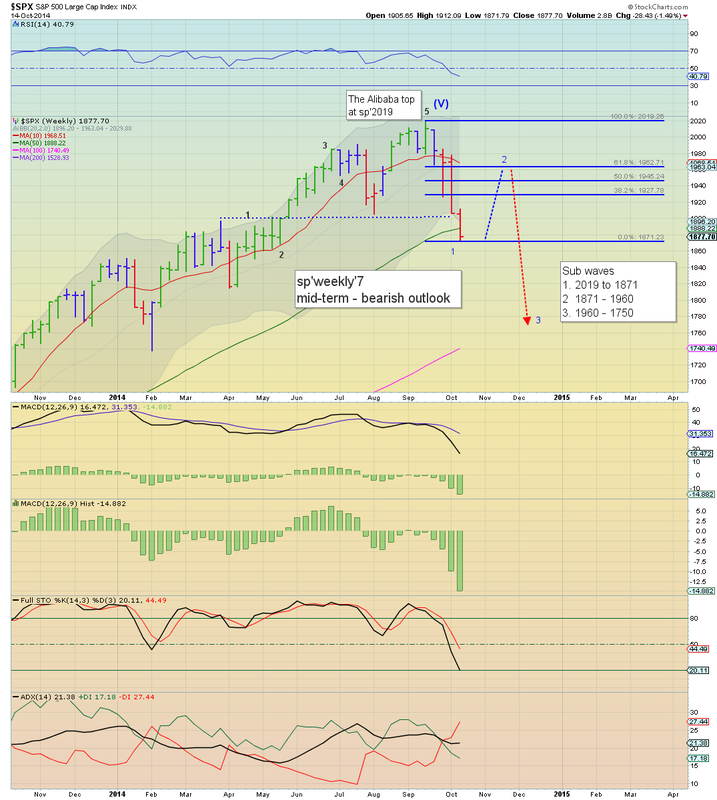 Primary upside on a bounce would be the weekly 10MA... somewhere in the 1950/60 zone... that is very viable within 2-3 weeks. The monthly 'rainbow' candle is an absolutely clear outright bearish red candle. Outlook is for further declines into early 2015. The only issue is whether we get stuck around $70, $60, or a brief foray into the $50s. Regardless, lower energy prices are bullish for the broader economy, and will most certainly help growth prospects across Q4 and the first half of 2015. We have a quartet of data, PPI, retail sales, empire state manu', and business inventories. There is also the latest Fed beige book at 2pm. No doubt Mr Market will be desperately looking for any signs that economic growth is continuing. US equities saw some further swings across the day, having peaked at sp'1898, but seeing latter day weakness, sp' +2pts @ 1877. The two leaders - Trans/R2K, settled higher by 2.6% and 1.1% respectively. 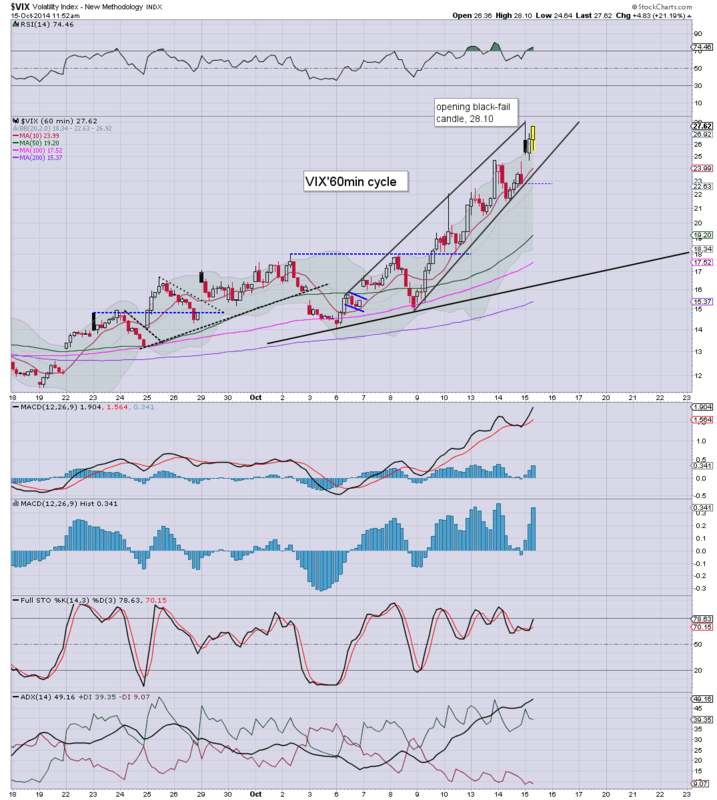 Near term outlook remains a 2-3 week bounce. We have new cycle lows for the Sp'500 and the Dow, although the two leaders - Trans/R2K, closed with some significant gains. Another discrepancy of high importance is that the VIX did NOT confirm the new equity lows with a higher high. Taken together, the broader market still looks due a 2-3 week bounce into late Oct/early November, before things get really wild on the downside.